3/30/2011 - How might the Mirran Resistance, a tiny group of survivors on an extremely hostile plane continue to fight the good fight?They're going to have to turn the Phyrexians own tools against themselves. 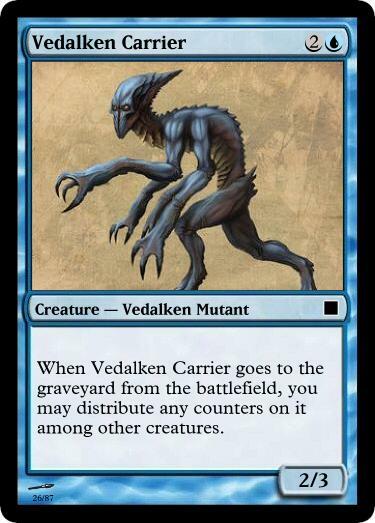 Vedalken Carrier lives to be infected. When he finally gives up the ghost, his infection will punish the very monsters that caused it. Nothing can unpoison you, but that doesn't mean you have to enjoy being poisoned. 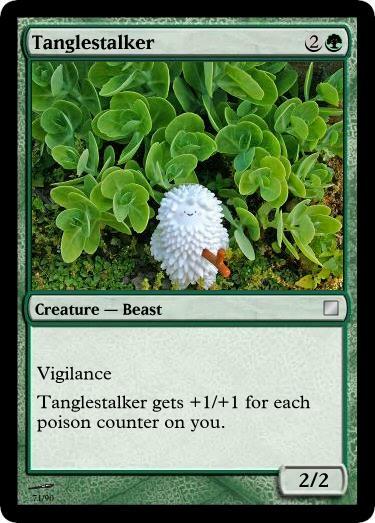 Tanglestalker hates it when you get poisoned and he will take his rage out on your enemies. 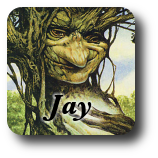 Okay, maybe you won't mind being at 5 poison when this guy comes down as a 7/7 for 3cc. 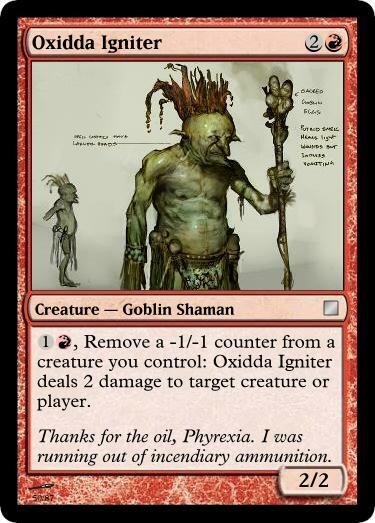 Oxidda Igniter is my favorite solution. 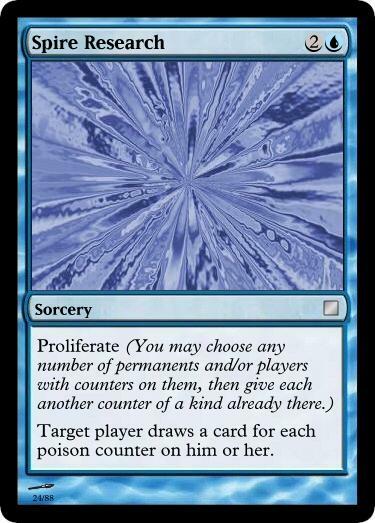 The Phyrexian Oil is their greatest weapon, right? Everything Phyrexian contains some of that oil? Umm, oil burns, right? Before Scars came along, I had speculated on poison-related mechanics with something along the lines of Spire Research, albeit closer to the form of "Draw two, if you are poisoned draw three instead" or similar. I do like the Igniter, but feel it's not as appropriate in this block as it would have been in Shadowmoor, since there is much less of an ability to put -1/-1 counters on your own creatures; it's almost entirely offensive. As much as I love the Igniter, I suspect it could never see print below Rare because it would make combat such a headache for both parties. It also strangely wants to be in a multicolor build, as it demands that its controller possess an expendable high toughness creature to absorb the counters. Only the words of Teen Girl Squad can express my love for Vedalken Carrier: Sooooo good!